(7 ft, 6 in. to 22 ft, 6 in.). Two adjustable 521-mm x 203-mm (20.5-in. x 8-in.) stabilizer wheels are included in base equipment to ensure straight travel and provide support on three-, four-, five-, and seven-standard sizes. The nine-standard size has four stabilizer wheels. The stabilizer wheels are designed to stabilize the unit and are not intended to be used as depth gauge wheels. The weight of the unit must be carried on the tractor. Additional stabilizer wheels and tires can be added if field conditions warrant more support. Closing wheels can be added to the rear of the 2100 Minimum-Till Ripper with 19-mm (0.75-in.) standards. Mounted close to the shank, allowing a high trip clearance for operation through washouts, etc. 559-mm x 5-mm (22-in. x 0.177-in.) 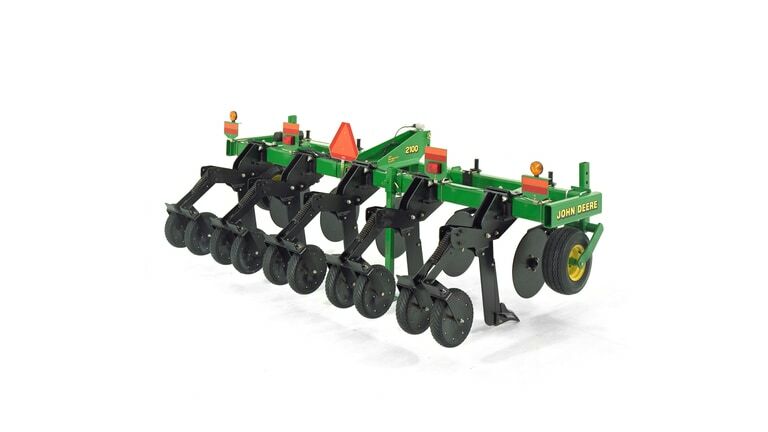 straight blade is in base equipment and allows the least amount of soil and residue disturbance. 559-mm x 5-mm (22-in. x 0.177-in.) rippled blade is optional equipment for use when increased soil movement is desired. The frame is constructed with a 102-mm x 152-mm x 10-mm (4-in. x 6-in. x 0.375-in.) cross tube on three-, four-, five-, and seven-standard machines and 152-mm x 152-mm x 10-mm (6-in. x 6-in. x 0.375-in.) cross tube on nine-standard models where the hitch-mounting components are welded for maximum strength. Truss tubes connect the cross tubes and are constructed with 127-mm x 127-mm x 13-mm (5-in. x 5-in. x 0.5-in.) steel tubing. Welded together into one assembly, the frame is designed to handle the most severe operating conditions. The mainframe is 4.06-m (160-in.) wide and is the same whether there are five shanks on 762-mm (30-in.) spacings. Frame extensions make this task possible and make configurations easier to adjust. A drawn hitch option is available for those who want to use large row-crop tractors or 4WD tractors without a 3-point hitch. The drawn hitch is only compatible with seven-standard and nine-standard 762-mm (30-in.) models. 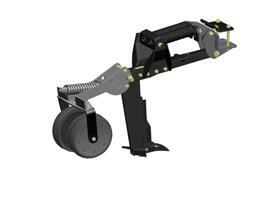 The drawn hitch is also available as an attachment for field conversion. The transport wheels are placed in front of the front rank of the mainframe. This allows residue to flow freely and keeps the wheels close to the standards to allow the ripper to follow the ground contour. 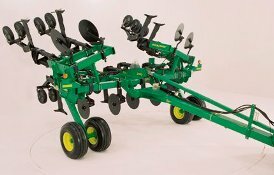 The wheel modules are mounted to the front, rear, and end frame of the ripper, making it the most stable wheel package in the in-line ripper market. The tires are placed directly in front of the ripper standards so the shanks can remove the tire track in order to leave as level a profile as possible. There is no need for stabilizer wheels with the drawn hitch. The wheels are located within 762-mm (30 in.) of the outside edge of the machine to provide stability in both field and transport conditions. The nine-standard model has eight-bolt hubs and spindles with beefy 12.5L-15 tires. The seven-standard model uses 11L-15 tires. The large tires provide excellent field flotation and transport stability. A pressure-compensating flow divider is the heart of the depth control system. Temporary adjustments can be made while maintaining the ability to raise and lower evenly. The machine does not need to be fully raised at the end of a pass to keep the cylinders in phase, and cylinder stops are used to set the overall operating depth. NOTE: The drawn hitch attachment is only compatible with serial number 1300 or newer machines. The 19-mm (0.75-in.) straight shear-bolt standard design moves through the soil minimizing soil and residue disturbance at the soil surface. The 19-mm (0.75-in.) straight standard is base equipment. It is also available as an attachment for field conversion. Option 1 7, 6 ft, in. Option 4 12, 6 ft, in. Option 7 17, 6 ft, in. Option 9 16, 6 ft, in. Option 11 22, 6 ft, in. Option 12 22, 6 ft, in. Option 4 13, 6 ft, in. Option 5 13, 6 ft, in. Option 6 13, 6 ft, in. Option 7 13, 6 ft, in. Option 8 16, 6 ft, in. Option 9 19, 6 ft, in. Option 10 17, 8 ft, in. Option 12 15, 6 ft, in. Size 4x6 x .375 in. Maximum underframe clearance 36 in. Spacings 22, 24, 30, 36 in. Description Two adjustable wheels on 3-, 4-, 5- and 7-standard sizes. Four adjustable wheels on 9-standard integral only. Drawn hitch machines do not require stabilizer wheels. Size 4 x 16 in. Spacing 9 to 13 in. Wheels 20.5 x 8 in.